"...an imposing building of real beauty... one of the few monumental skyscrapers of the early part of the Twentieth Century." 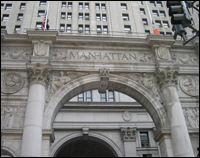 The David N. Dinkins Municipal Building is at the intersection of Chambers and Centre Streets, east of City Hall Park and just north of the Manhattan entrance to the Brooklyn Bridge. It is among the largest government office buildings in the world, housing over 2,000 employees from a dozen municipal agencies in nearly 1 million square feet of office space. The building houses the offices of three elected officials – the City Comptroller, the Public Advocate, and the Manhattan Borough President – and is the headquarters of the Department of Citywide Administrative Services, which manages the building. Also calling 1 Centre Street home are the Department of Finance, the Tax Commission, the Civil Service Commission, the Landmarks Preservation Commission, and the Office of Payroll Administration. Field units of the Office of the Mayor, the Department of Buildings, the Department of Environmental Protection, and the Department of Information Technology and Telecommunications are also located here. The main building has 25 floors and 33 elevators, with another 15 stories in the central tower. Over 1,000 people use the various services and agencies located in the building every day. Occupying a storefront on the ground level is CityStore, the Official Store of the City of New York, which sells books, gifts, collectables and souvenirs of New York City. The limestone building incorporates Roman, Italian Renaissance and Classical styles of architecture. A major feature in the design is an open plaza, screened by Corinthian columns, that appears to be carved out of the first three stories of the structure. The plaza flows into a central triumphal arch, inspired by the Arch of Constantine. So grand is the arch that automobile traffic flowed through it before Chambers Street traffic patterns were altered. Today, the barrel-vaulted passageway is open to foot traffic. The building's soaring classical exterior rises from modern roots: the Municipal Building was the first building in New York City to incorporate a subway station at its base. 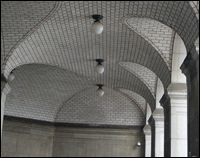 The subway station entrance at the south end of the building is covered by an arcaded plaza notable for its dramatic vaults of Guastavino tile construction. Surmounting the central tower is a 20-foot tall gilded statue,"Civic Fame," fashioned by sculptor Adolph Weinman. Constructed of sheets of copper with a hollow core, this female figure stands barefoot on a sphere and wears a flowing dress and a crown of laurels to signify glory. 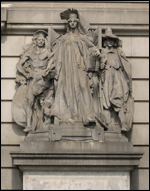 In her left hand she holds out a five-pointed crown representing the five boroughs (Manhattan, Brooklyn, Bronx, Queens and Staten Island). Various types of sculpture and relief cover portions of the Municipal Building. The central arch is decorated with sculpture in the Roman manner as was used in the Arch of Constantine. Over the side arches are rectangular allegorical panels. At the left (north), Civic Duty is represented by a woman personifying the City, accompanied by a child holding the seal of the city. On the right of the arch (south), Civic Pride shows the female personification of the city receiving tribute from her citizens. Adolph Weinman, the sculptor of Civic Fame, also designed the shields that were used in the elevators, on the molding above the colonnade and again on the false colonnade above the 22nd floor. They represent New Amsterdam, the Province of New York (under English rule), the City of New York, the County of New York and the State of New York. This beautiful building has a rich history. By 1884, the City of New York had surpassed the limited physical space in City Hall and additional space was required for all of the many functions and services needed for a city which then numbered over a million. Many of the growing government agencies that were necessary for such an expanding city were located in rented offices in privately owned buildings north of Wall Street, extending to what we now call Midtown. In his second annual report to the Board of Alderman in 1884, Mayor Franklin Edson stated that City Hall was becoming too crowded and that its "style of architecture was such that without marring its present symmetry, it couldn't be enlarged to the required extent." Continuing lack of space and a general desire to decrease rents paid by the city to landlords led to the appointment of a commission in 1888 by Mayor Abraham Hewitt to select a site and advertise for plans. Four architectural competitions were commissioned between 1888 and 1907. The fourth, and final, competition for a design for the Municipal Building was commissioned by the Commissioner of Bridges, whose agency had acquired part of the designated land for a new terminal for trolleys that ran across the Brooklyn Bridge. Twelve architectural firms submitted plans for a new building in the final competition. The winning submission was designed by a young partner in the firm of McKim, Mead and White, William M. Kendall, who based his design on the Royal Liver Building in Liverpool, England. By the time the award-winning design was selected in 1908, New York City included five boroughs and over 4.5 million people. By 1909, the foundation work began on what was soon to be one of the largest government office buildings in the world. The firm of McKim, Mead and White was internationally renowned and was then the largest architectural firm in the world with a staff of more than a hundred. The Municipal Building was the firm's first skyscraper. The firm's work was well respected by the profession and well known for their quality of construction and the contractors used. Other examples of this firm's work include the Rhode Island State Capitol building, the Morgan Library and the American Academy in Rome. The Municipal Building was completed in 1914, but the first offices were occupied as early as January 1913. By 1916, the majority of the offices were full and open to the public.  The total cost of the project was $9 million, which included the cost of the land. The building was designated a landmark in 1966 by the City's Landmarks Preservation Commission and has seen two major renovations, the last completed in 1993. For many years, the Municipal Building gained fame as the place where over 30,000 New Yorkers were married each year at the Office of the City Clerk, in civil ceremonies lasting about four minutes. In 2009, the City Clerk's Office moved to nearby 141 Worth Street. In a ceremony on October 15, 2015, Mayor Bill de Blasio and First Lady Chirlane McCray renamed the Manhattan Municipal Building for former Mayor David N. Dinkins in honor of his decades of public service. Of all the government buildings in New York City, the Municipal Building has the strongest connection to former Mayor Dinkins. He spent 14 years of his career there: ten years as the City Clerk (from 1975 to 1985) and four more years as the Manhattan Borough President (from 1986 to 1990). When he was elected the City’s first African American Mayor, he moved across the street to City Hall. 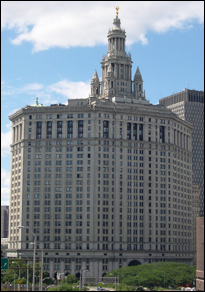 The Municipal Building is a significant piece of New York City architecture. Renowned architecture critic Paul Goldberger described the building as an object lesson in “sensitive urbanism” – a fitting description that also applies to Mayor Dinkins’ governance. The David N. Dinkins Municipal Building is a designated New York City Landmark.